LG's G Flex 2 is the company's second attempt at making a curved, flexible smartphone, and it's like the first try with properly bumped-up specs and a more manageable 5.5-inch screen. The new LG G Flex 2 isn't the world's first curved smartphone, but it is the first one that has the muscle to back up its constant, ostentatious flexing. This concave Android phone is the follow-up to the 2013's LG G Flex and, while it bends the same way, it has new dimensions and a much better display that make it less of a gimmick. LG G Flex 2 is noticeably smaller and easier to hold with a 5.5-inch screen, which matches the display size of the LG G3. The previous Flex was a full 6 inches. Going with that new, more manageable size is a high-resolution P-OLED touchscreen that's 1080p, up from the decidedly deficient 720p display of the original. With a faster Snapdragon processor, speedier RAM and Android 5.0 Lollipop on board this banana-shaped phone, the LG G Flex 2 is both trendy-looking and powerful - most of the time. The specs make more sense this time around, but does a curved smartphone make sense to begin with? I bent over backwards to test out all of the following features in my full review. Straight from South Korea, the LG G Flex 2 I tested is now available on three US carriers. Sprint was the first with the phone in early March, followed by US Cellular. The LG G Flex 2 for AT&T lands on April 24. Verizon and T-Mobile haven't announced release dates. In the UK, Vodafone was the exclusive carrier for the first six weeks starting in March. It's now available SIM-free through Carphone Warehouse. How much does it cost? While it's the equivalent of $737 (about £480, AU$943) without a contract in LG's home country, Sprint is charging $200 with a two-year contract. Without an lengthy agreement, the LG G Flex 2 price is $504. US Cellular has a better contract price of $150 upfront, but a worse pre-paid option at $630. AT&T charges a heftier $300 on-contract and $709 off-contract, more than both carriers. Vodafone, meanwhile, is selling the curved phone for £19 with monthly plans starting at £39.50. Looking for a SIM-free option? Carphone Warehouse now offers it for £500. All prices are infinitely better than the original Flex that cost $700 (£690), except for those from AT&T. As the name suggests, the LG G Flex 2 features a slight curve from top to bottom. That's in contrast to the Samsung Galaxy S6 Edge, which curved on its right and left sides. It doesn't radically change the look and feel of the phone like LG's marketing would have you believe. Instead, the curve gives it a subtle bow in the middle so, like one of LG's new 4K TVs, its faint curvature goes from a 400mm to a 700mm radius. It's a little more durable by flexing, a little more immersive for multimedia viewing and a little better-sounding during phone calls. The Flex 2 felt contoured to my face and more accessible with one hand than a normal 5.5-inch phone. Throwing it under my foot several dozen times to apply pressure and straighten out the frame, the phone always flexed back into its original arch shape. I've seen the G Flex withstand 1,000 pounds of pressure, and LG claims this one is even stronger. It's the ultimate anti-iPhone 6 BendGate phone. But more than anything, the G Flex 2 comes off as a trend-setting phone, even if a technical need for such a design is as subtle the curve. It serves to spice up the almost-always-flat and boring phone designs we see year in and year out. The Flex 2's colors include Flamenco Red and Platinum Silver at launch, and I happily ended up with the more-striking red variant. 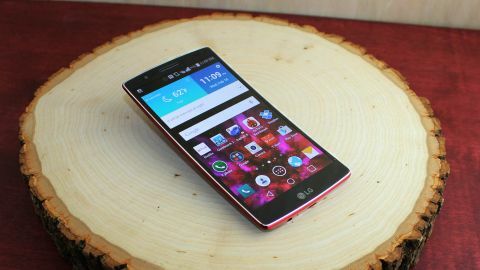 To that point, the LG G Flex 2 attracted plenty of looks and praise from people I showed it to this week. Yes, it's plastic, but it's also extremely lightweight for its size at 152 g (5.36 oz) and feels natural in a pocket. It seemingly disappeared in my left pocket during a three-hour bike ride, whereas I my "smaller" iPhone 6 felt ever-present in my right pocket. That has actually been the No. 1 question everyone has had about it: how is a curved phone supposed to fit in your pocket? Remember, thighs - at least mine - are curved. And back pockets? You better believe that area is plenty curved too. The LG G Flex 2 actually fits better than any straight-shaped brick phone. In fact, the only two problems I've had with the curved design is getting a case to protect it and attaching it to my car windshield's via an existing smartphone dash mount. Of course, a case isn't supposed to be all that necessary. Like its predecessor, this second edition of the phone boasts a self-healing back, one that kicks things into "advanced" adjective mode. That's right, LG now has coined the bluntly-named "advanced self-healing back." It can recover from light scratches in about 10 seconds, due to its high-density molecular shell. The previous Flex took about three minutes for its mutant Wolverine-like powers to kick in. That's an impressive turnaround, but looking at the back cover, I still received what must be considered "medium" scratches that haven't gone away. Sadly, it doesn't live up to the hype - don't put this phone in the same pocket as some teethy keys. Complimenting the Flex 2's easy-to-grip tiny arch is the fact that it has no buttons on the frame. The side and top are free of the power and volume buttons I so commonly press on other phones that I grab. LG stuck with its design formula that puts them on the back cover. The placement will always be strange. It's either a love-it wise decision or hate-it design flaw. Getting used to where the power button is was difficult at first and often led to inadvertent camera smudges. Taking screenshots of the Flex 2's interface was also a problem. That said, with a little practice, my index finger and brain got used to the novel approach eventually, and I really appreciated the button-free frame. I also heavily relied on the double-tap-to-wake technique to turn on the screen. I can't say I could ever get used to the back speaker, however. At a time when the top-rated HTC One M8 and its successor HTC One M9 are giving us front-firing stereo BoomSound speakers that project music in the correct direction, LG is busy spitting the jams from one speaker embedded in the back cover. It's a powerful tweeter, sure, but awkwardly placed. The original LG G Flex developed a cult following, one that lauded its 6-inch phablet size, and some of those people will miss that aspect. No one will miss the 720p display. LG uses the same curved plastic OLED display technology, but gives the Flex 2 the 1080p, full HD boost it deserves. More pixels combined with the smaller 5.5-inch display leaves us with 403 pixels per inch, not the original's jaggy-ridden 245ppi. That's a real reason to buy this phone. The screen looks like it has 2.5 times as many pixels, because, well, it does. Less important, and not a real reason to buy it, is the "immersion factor." I found myself sucked into games a tiny bit more and, in landscape mode, the phone offers just the right bezel-to-screen ratio. It's easier to see in sunlight too, but its value is negligible. In fact, for the expected LG G Flex 2 price, you can get a higher-resolution smartphone right now, even one from LG, and save money. Its own LG G3 flagship sports a 1440p Quad HD display that measures 5.5 inches. Its 2,560 x 1,440 resolution comes out to 534 pixels per inch. So, as much as the G Flex 2 has caught up, the competition is now further along, packing in even more pixels than before. And the LG G4 release date may be a few short months away. Extra pixels are nice, but 1080p should be good enough for everyone, whether or not they're stuck using Apple devices (that's the max "cutting-edge" resolution for just the iPhone 6 Plus). The jump from 720p to 1080p is more significant to the human eye than the trendy move to 1440p, anyway, and the G Flex 2 screen offers more durability. Its specially coated Gorilla Glass 3 treatment, dubbed Dura Guard Glass, makes it 20% more durable, and the curve makes it likely to survive drops 30% more than flat phones. That's something that can't be matched. Not yet at least.